Enchange was selected to design & implement a Sales & Operational Planning (S&OP) Programme in Africa for this multinational Mobile Telecoms provider. Enchange designed a simple, standardised, set of S&OP & related processes. The programme was piloted in Congo Brazzaville & rolled out throughout Africa. (Sales Forecasting, Procurement Planning, Inventory Planning) integrated with the ERP System. A robust operating platform to support the organisations’ growth. Significantly reduced stock outs of prepaid cards. Sales uplift approaching $1m dollars. 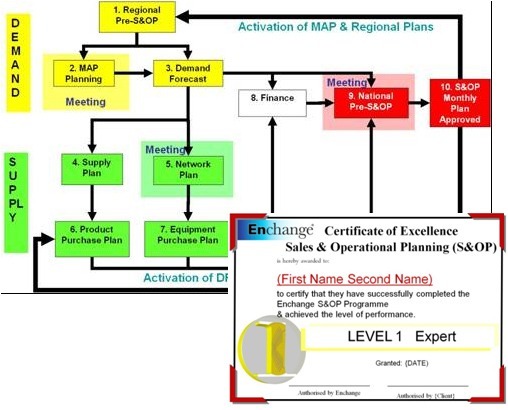 What is Sales & Operational Planning? Learn more about the Enchange approach to S&OP?